After trying and failing numerous times over the last couple of years to lose weight and live a fit and healthy lifestyle, Riaan Smit finally had to sit down and figure out why his efforts were not successful. The answer was that his schedule simply did not allow for regular visits to the gym and his solution for this issue was to start training outdoors. That meant finding something he could do any time of the day, no matter where he was. 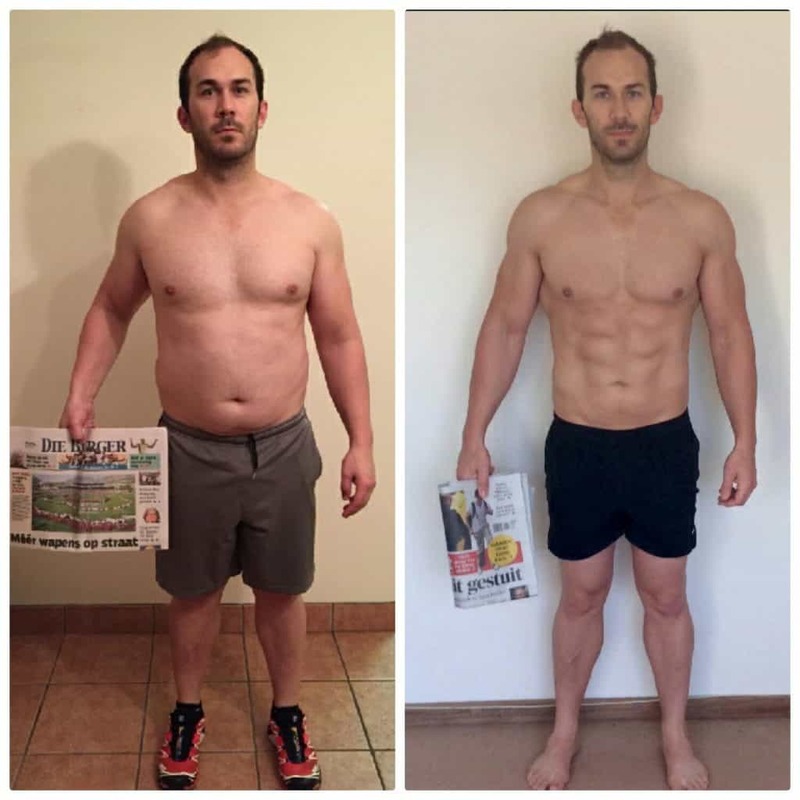 Eventually, Riaan kick-started outdoor training, entered the Ultimate Sports Nutrition(USN) 12 week Body Makeover Challenge and after losing 20.3 kg of body weight and 10.9% of body fat, he emerged as the male winner of the competition. 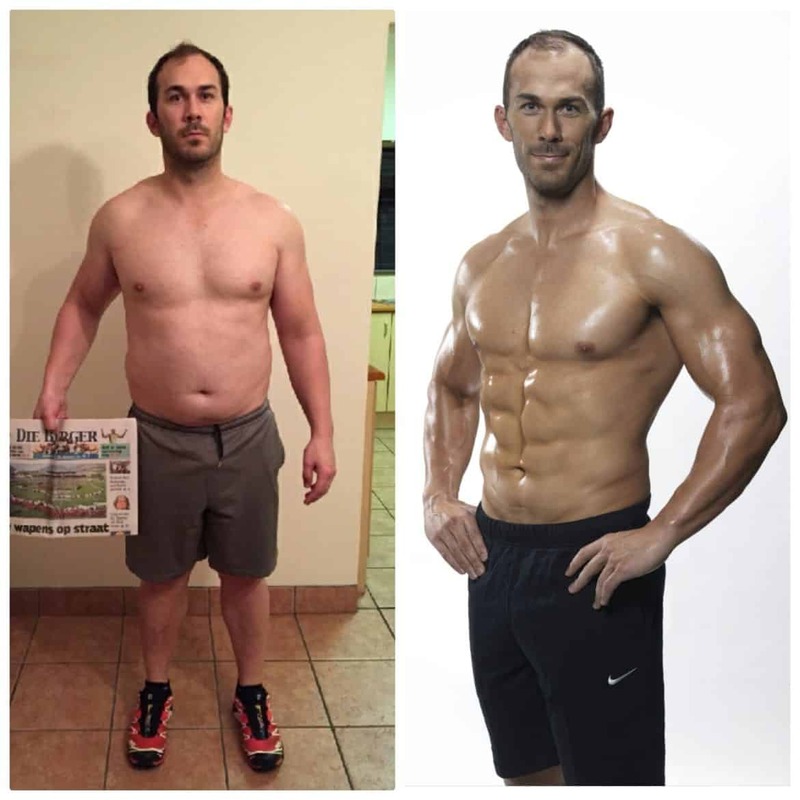 Fitness Chat with Riaan Smit, looks at his, USN before and after the weight-loss journey, his life after winning the USN 12 Week Makeover Challenge and so much more. Read on and be inspired. Can you tell my readers who Riaan is? I’m just an ordinary guy, father of two little girls and a husband. What influenced you to want to lose weight and enter the USN 12 Week Makeover Challenge? I just reached a stage where I was feeling very unhealthy and sick all the time. High cholesterol among other health issues became a reality for me and I had no energy to play with my kids. I just knew I had to make the change, not only for myself but for my family as well. What kind of workouts did you do when you finally decided to get fit? I went to the gym 3 times a week and did around 4 jogs a week, with the occasional trail run over the weekends. And what foods did you and did not eat? I removed all processed foods from my diet and only started eating whole foods. The easiest way to do this is to look at the ingredients chart of the food you’re eating – if it has more than one ingredient, well don’t eat it! Months later after winning the USN 12 Week Makeover Challenge, how has your diet and training changed? My diet has changed a bit since then. Training for multi-stage endurance events and marathon running requires me to eat a bit differently but I keep my number 1 rule when it comes to eating. That is, to not eat any processed foods. As for my training these days, I only train outdoors running 60-70km a week and trying to do about two bike rides per week with the occasional swim. Living in Kleinmond with its beautiful surroundings makes it a pleasure to train outdoors. Have you gained any weight since winning the 12-week makeover? What has been the hardest part of your USN before and after? Did you ever feel like giving up whilst on your weight-loss journey? What has been motivating you to keep going? Giving up was never an option for me. I knew this was my last chance to make a lifestyle change. Turning 30 just made me realise that I had to give this my all and that I needed to stay motivated. I have set myself goals in advance, and for this year my events have already been set out until November 2017. This way I have a constant goal to work towards. When I reach one of my goals, I take a couple of days off and then start training for my next goal. These goals help keep me motivated. What advice do you have for someone who is overweight and trying to lose weight? Be brutally honest with yourself. Figure out why you are in the position you are today. Set yourself a realistic goal and figure out which steps you will need to take in order to reach your goal of a healthy lifestyle. I found that the USN 12 Week Makeover Challenge starter pack (available at DisChem or USN online store) was an amazing starting point. It contained a complete a-z solution training program, eating plan with supplements, as well as a guide on how to use each product. Secondly, I would say start doing activities you like. If going to the gym isn’t for you, then don’t do it. Join your local running club, squash club or start doing any physical activity you enjoy. Just start moving. Check out these tips on how to maintain weight after weight loss. What would be your advice to some struggling to stay consistent? Consistency is your key to success in anything you do. I ensure consistency by setting one big goal, with a couple of smaller goals which will help me reach my main goal. Every time I reach one of my smaller goals I reward myself. So for my USN 12 week Body Makeover challenge, my big goal was to lose 15kg in 12 weeks. In order to achieve this, my first “small” goal was to make it through the first 2 weeks without cheating on my diet. When I reached that goal, I rewarded myself and started focusing on my second “small” goal, which was to get to the halfway mark of losing 7.5kg. In this way, I used my smaller goals as stepping stones, which in combination with the rewards, always made me feel like my end goal was within reach. What are your favourite workout routines? I love cycling. Getting on my bike and cycling next to the ocean for 3 hours is absolute freedom! Haha, you are such are a show-off, we get none of that ocean experience here in Gauteng! So, what do you do when you are not training? Well when I’m not training, I’m usually at work, but these days with my eldest daughter just starting grade 1, life seems to have become a whole new type of crazy, and still adjusting to this 🙂 On weekends, it’s family time and we try and spend as much time together as possible. How has your life changed after winning the USN 12 Week Makeover challenge? It’s been amazing being a brand ambassador for USN. The past year has truly been an awesome experience and I would like to take this opportunity to thank the USN team for making me feel part of the #usnfamily. USN has done so much for me, their support has really been amazing. I will definitely stay a loyal ambassador to this great brand and keep on promoting the USN 12-week makeover challenge, I truly believe in it! I received hundreds of messages from people asking for advice after seeing my photos in magazines and in pharmacies. It’s a great feeling, knowing that you might have motivated or inspired someone to reach their fitness goals through your results. What an amazing journey! Great motivation for living a better lifestyle. Eating whole foods and eliminating processed foods is a great way to kickstart a healthier lifestyle. Thanks for sharing! He looks great! I hope he is happy and healthy. Thanks for sharing!